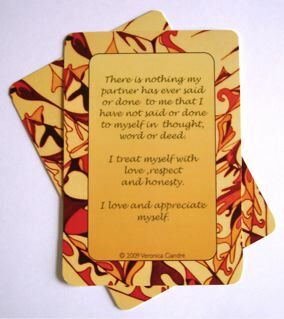 My Peace Deck is a set of 40 cards with 40 affirmations to help you navigate your relationships from the inside out. Welcome to My Peace Deck, a place from which to navigate relationships, especially the challenging ones, from the inside out. In my personal attempt to stay present during the pain of a break-up in 2009, I needed frequent reminders to keep my heart open, trust the process, and breathe. My Peace Deck was created to address that need and more. This site does not address all relationship issues, and I recognize and respect the fact that everyone and every situation is different and may require different tools. Sometimes the best advice when in a challenging relationship, is simply get out, get over and get on with it. Then there are those times when if we have the courage to look into the mirror that is our relationship, without averting our gaze, the gifts to our personal evolution will eventually look back at us with all the power, support, commitment and love we thought we would find in someone else. My Peace Deck is dedicated to that process... to staying present even when it hurts, and to remind us that in every relationship, there is something to learn about ourselves. "My beliefs about relationships are the best forecast of what will show up. It is always up to me what I choose to believe. i believe anything is possible." My Peace Deck.